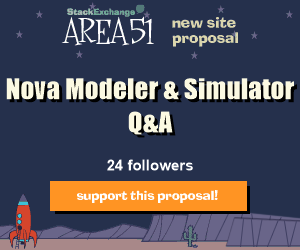 We are currently in the process of creating a Q&A site for Nova on Stack Exchange. To view the proposed site, support our project, and submit your own questions, click on the image above to sign up, or sign in to Stack Exchange and “follow” us. It doesn’t take very long and will move us one step closer to having an excellent Q&A site. This is a multi-step process that requires user support. If you’re not familiar with Stack Exchange, here’s how the process of getting a site on Stack Exchange works. There are 3 phases that must be completed before the site is put on Stack Exchange. With your help, we can get a helpful and easy to use Q&A site. 1. Submitting that would be relevant to a Nova Modeler Q&A site. Each new user has 5 upvotes to give. 1. 100 users (with at least 200 reputation) committing to the site. This is an actual version of the site.